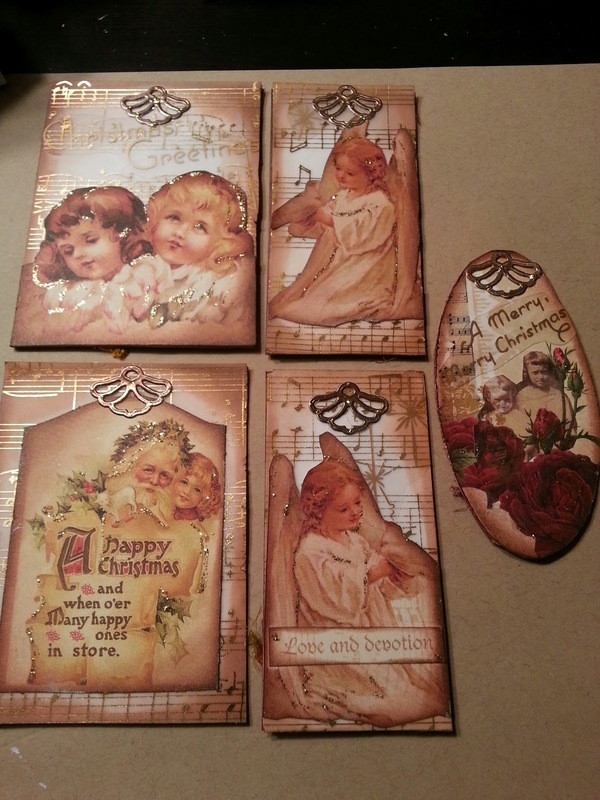 Today's post is part of Susuan K. Weckesser's Christmas Love Campaign. The campaign was started after Susan lost her father to cancer and her mission is to share love at Christmas time. 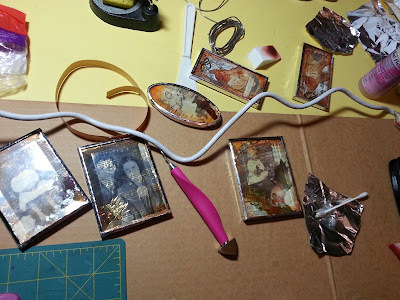 You can read her story at My Sweet Earth, today, I am sharing a beautiful project that combines paper crafting, glass and metal and let me share some Christmas love with my family and share our family heritage at the same time. Preserving your family heritage is an easy way to show your family how much you love them, lets you share stories and memories of loved ones who are no longer with us, and lets you discover together the intricate and often fascinating fiber that weaves us together into a rich tapestry of family love. At this time of year, we’re completely consumed with going to parties, shopping for presents…the decorating; the complete and utter chaos that envelopes us at Christmastime can be overwhelming. And the real joy of Christmas is often overshadowed by the pressure to shop, spend, give…This year, I made a very conscious decision to give “handmade.” There’s no better way to share your love than to share something made by your hand. Sure, I have spent many nights cutting, gluing, soldering, painting and creating…but I’ve spent that time in the peace of my home surrounded by music, things and people that make me happy. I have yet to go to the mall or visit one of those mega discount stores. And I feel all the better for it. In these very challenging days, giving handmade gifts, especially like the ones I am sharing with you today, will touch hearts and will let you preserve and share your family heritage. 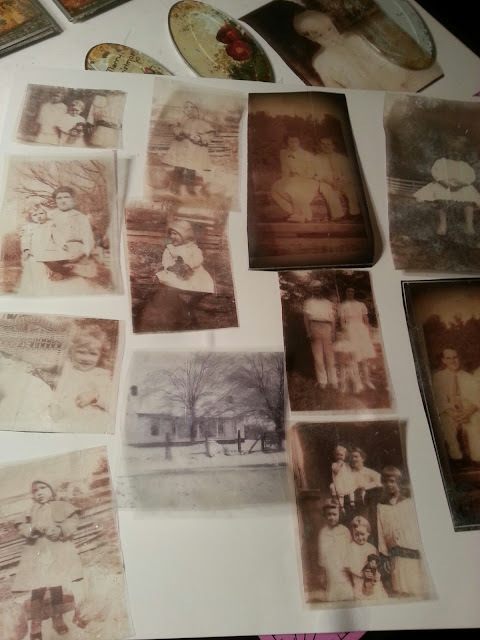 This heritage project started in November, while I visited my parents in Indiana at Thanksgiving when my mother and I started scanning boxes of old family photographs. As we were working through the piles I started to realize how very lucky we were to have this record of hundreds of photos and how special our family truly is. We were farmers, we were workers and we were makers…life in rural America at the end of the 19th century was hard…money was dear, and usually if you wanted something, you had to learn how to make it…you might have guessed by now that crafting is in my DNA. 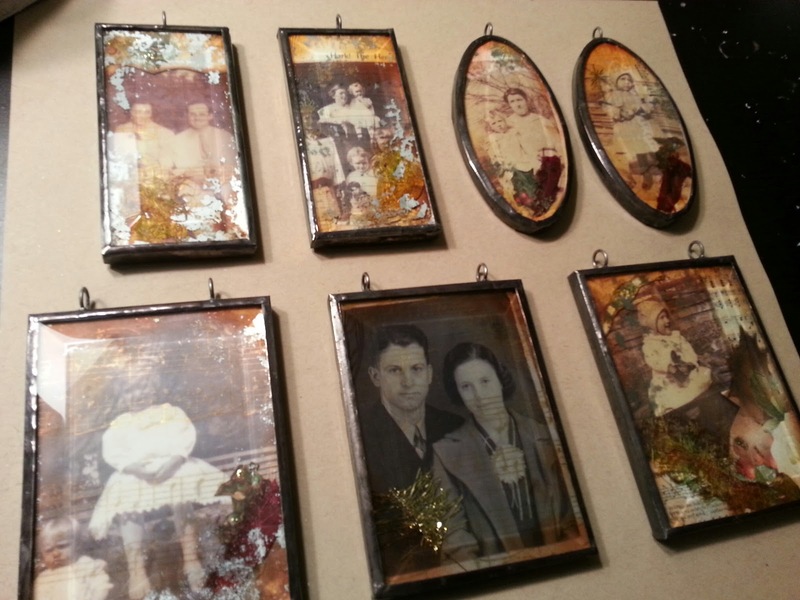 After the holiday, I returned home to Phoenix with the images in my mind…I love working with vintage family photos and really wanted to create some art objects that preserve the images in a decorative way, and in a way that would invite family story-telling and memory sharing. To share the images we’d worked on together, I decided to create some special Christmas ornaments that would be in character with life in rural America at the end of the 19th century and preserve our heritage in a way that could be enjoyed for many years to come and hopefully by generations to come. First I created photo transfers onto clear acrylic sheets. This technique captures a transparent image. Anything you place the image on shows through the photo. 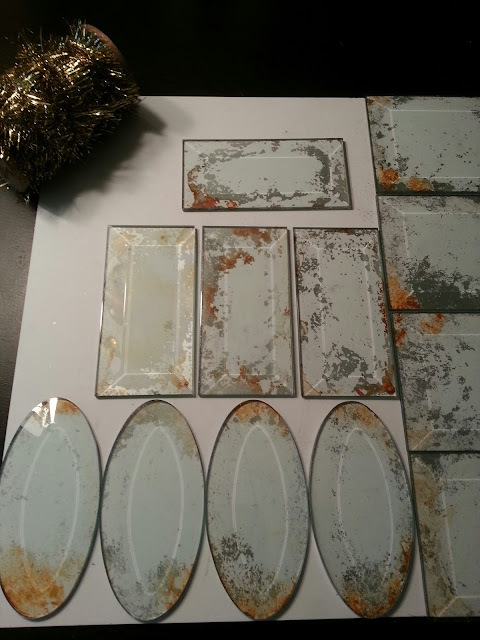 Then using some spray paints and alcohol inks, I faux finished beveled glass pieces to give the effect of antique mercury glass. 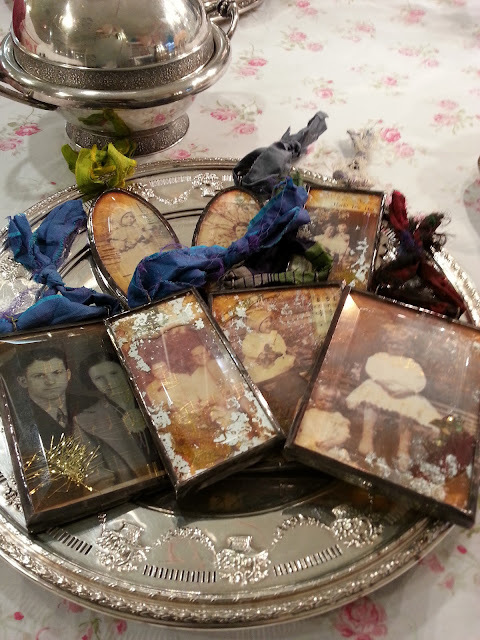 Next, I created mini collages using the images and scrapbook papers. Here, you’ll see the reversed side of the collage. I used Graphic 45 paper and tiny elements using Spellbinders die templates and craft foils for a very vintage look. Ink and glitter also add a layer of instant age to the collages. 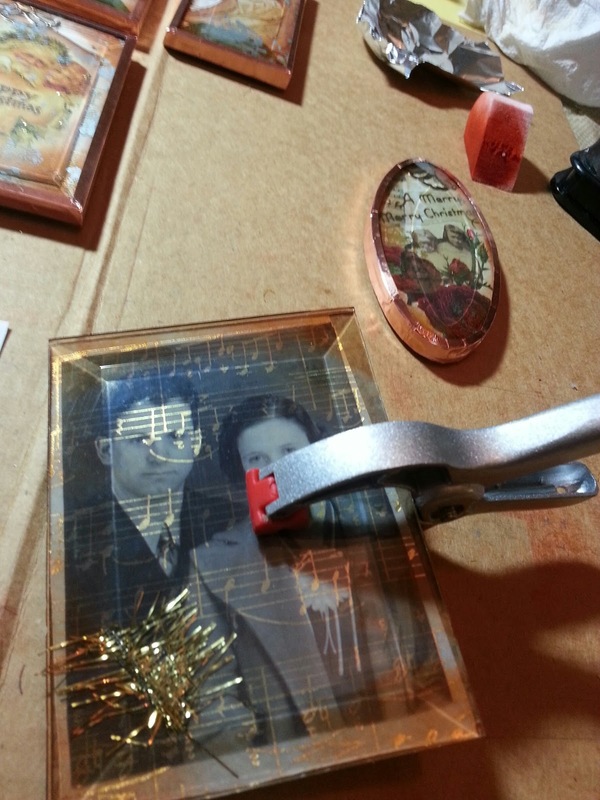 Enclose the collages between t layers of beveled glass then use copper tape to seal the edges and hold the solder. Apply flux and solder around each piece. I’ve been really fortunate to have worked with Guiseppina "Josie" Cirincione, who has mentored and taught me some very cool soldering technique through this project. Her book Solder Technique Studio: Soldering Iron Fundamentals for the Mixed Media Artistis an invaluable resource. Then to finish the ornaments, remove all residue with a spray bottle of alcohol, then apply liquid patina to the soldered area to age the metal. I added strips of antique saree ribbon to hang the ornaments. The look is elegant and harkens to the fact that crafters or makers generations ago used strips of old clothing or fabric strips to create yarn or string. Each one of these ornaments tells a story, stories of my grandparents on their wedding day, stories of my great grandmother and great grandfather and their lives on the farm in rural Kentucky. I love looking at the ornaments, each one is a treasure. It’s been a real joy to create them and a privilege to share them with you. And I am really looking forward to sharing them with my family this week over the holiday…I expect we’ll get to tell stories to my nieces and nephews about days and times that are long ago and far away…and I am really excited to share and preserve a small bit of our family heritage. Thank you again for letting me share this with you today during Susan K. Wessecker’s Campaign of Love. It’s so important to share family traditions and to preserve our heritage, especially during the holidays. Make sure you LIKE the Christmas Love Campaign on Facebook. 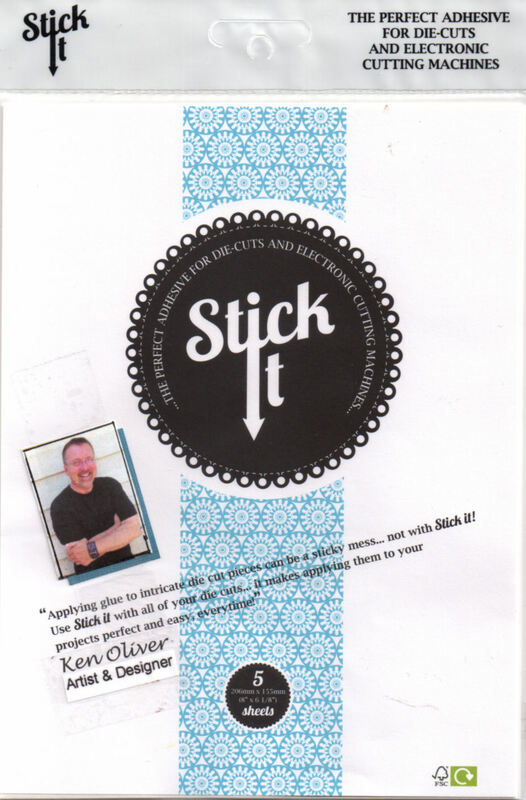 Share your photos and stories there and you'll be entered to win a subscription of Canadian Scrapbooker. Merry Christmas All…Make sure you create something beautiful today! Ken, these are truly amazing! You are amazing! I am so wanting to learn to do the soldering ... all because of your inspiration! Merry Christmas to you and yours ... and give your Mama a huge Christmas hug from me when you see her ... now that she and I are friends on Facebook, I think we would have a great time together! Merry Christmas Friend!!! Hi Becky, thank you so much. I appreciate your kind words. Soldering is really fun. I'll give my mom a hug too...you and her are cut out of the same cloth. We will have to figure out if we can offer some classes or something in your area. It would be fun. Merry Christmas to you and your family! Love this project! I have been wanting to learn how to solder for a while now and this makes me want to learn even worse. Thanks for the recommendation on the soldering techniques book. Merry Christmas, and I can't wait to see you in January! Thank you! 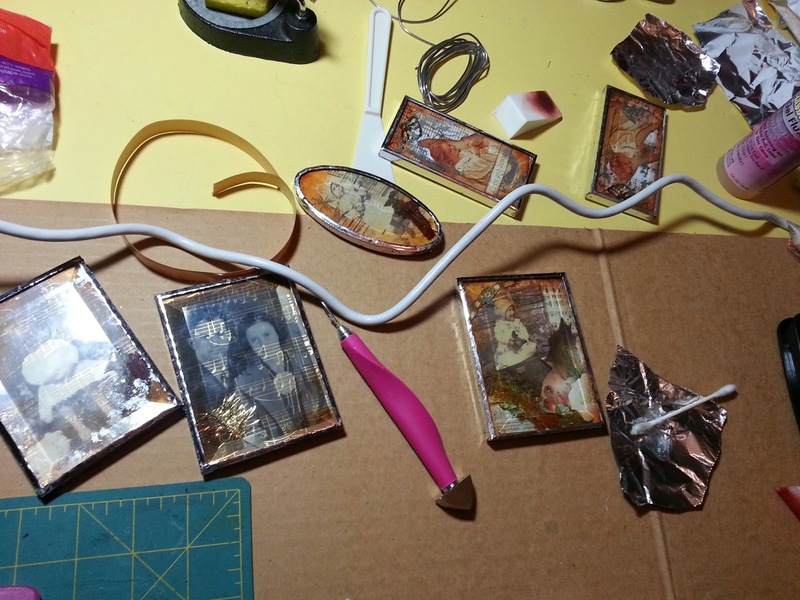 Soldering is fun and let's you create some beautiful art. I can't wait to see you in January too! Merry Christmas! Beautiful. Adding more Spellbinders to my wish list. Thank you Allie...glad to hear you have some Spellbinders on your wish list. Better get ready to add some more new dies to your list...CHA releases are gonna blow you away! Merry Christmas and Best Wishes in the New Year. Ken, these are amazing! 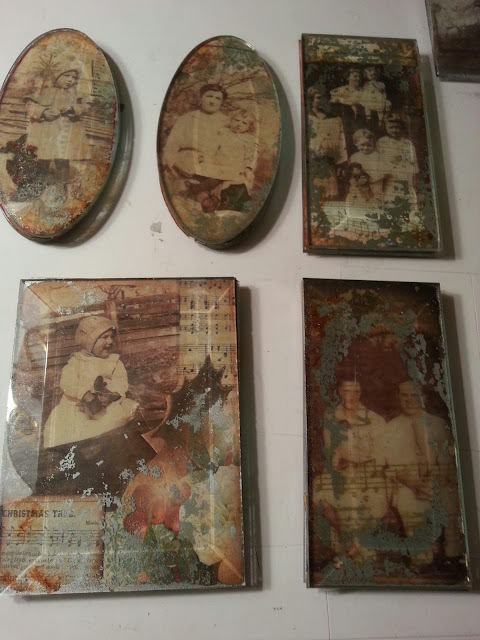 Love how you added the faux antique finishes. Do you have a source for the beveled glass? Thanks for sharing your talents. Hi Nancy, Thank you. 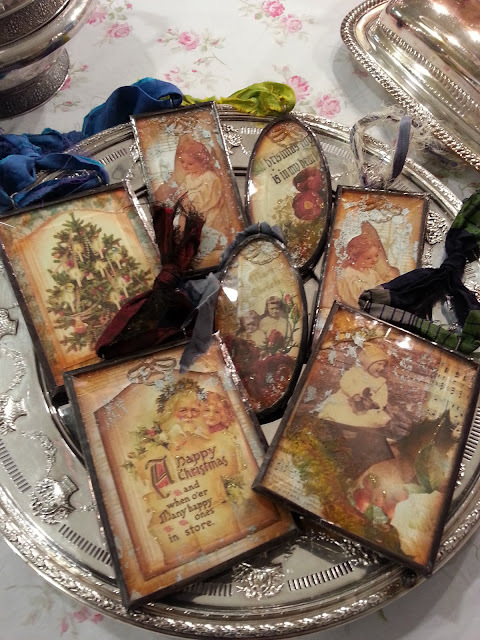 I purchased the beveled glass pieces at Melrose Vintage in Phoenix. They have a good assortment of sizes and shapes. They should be on your "to do" list next time you are in Phoenix. Thank you again! Merry Christmas. for those of use who are avid crafters but have never used the products you mention in this post, can you please share a list of supplies complete with the "name" of the product? acrylic sheets- like transparancies? HOW is the antique mercury glass technique made? etc..
Hi Gwen, Thank you...the techniques and methods are pretty easy to learn...but I would recommend getting a copy of Solder Technique Studio: Soldering Iron Fundamentals for the Mixed Media Artist, by Guiseppina "Josie" Cirincione, or take a class if you can. It kind of helps when you have a teacher right there to demonstrate in person...I think some stained glass stores offer the same kinds of soldering classes. The mercury glass is pretty easy. Start with cut glass pieces or beveled glass pieces, mist them with a mixture of water and vinegar, then spray lightly with Krylon Mirror paint of chrome spray paint. Drip a few drops of dark alcohol ink on top of the paint, then let it dry. Lightly buff away the paint so can see through the glass, but making sure to leave some paint and ink on the glass. You will have to experiment to see what works best for you. it's a fun craft that is pretty easy to do...thank you again. These are sensational Ken. They really look like vintage treasures. The happiest of holidays to you! Thank you Seth...they were incredibly fun to make. Happy Holidays to you! Wow such wonderful treasures for your family and friends to receive this Christmas, tfs! Thank you Connie. Happy Christmas to you and your family! These are wonderful!!!!!!!! I'm sure your family must have loved them!!! As one who loves and appreciates old family photos and vintage things, I thought these ornaments were magnificent, and a lovely thoughtful gift. I just stumbled upon this blog. I have the same sentiments as you when it comes to family history. Stories need to be told to our future generations. Love your ornaments and your article!